I'm a nostalgic person. I value memories exponentially more than possessions. So when it comes time to pack up and move on to a new chapter of life, I tend to neglect the necessary chores in favor of revisiting people and places, shoring up batches of fresh memories. Friday marked the beginning of our last week in California. Although there is a lot to do, there's even more urgency to do all the things. My friend Jan thought it a travesty that in five years of exploring wide swaths of the Bay Area, I'd never managed to ride the trails in Water Dog Lake park. It's one of those smaller islands of open space in the suburbs. There are only about a dozen miles of trails, but they're refreshingly technical and scenic. Due to carpal tunnel syndrome keeping me off the bike (four weeks and counting, sniff sniff) I still can't say I've ridden Water Dog. But Jan did guide me on a fun six-mile trail run on Friday evening. 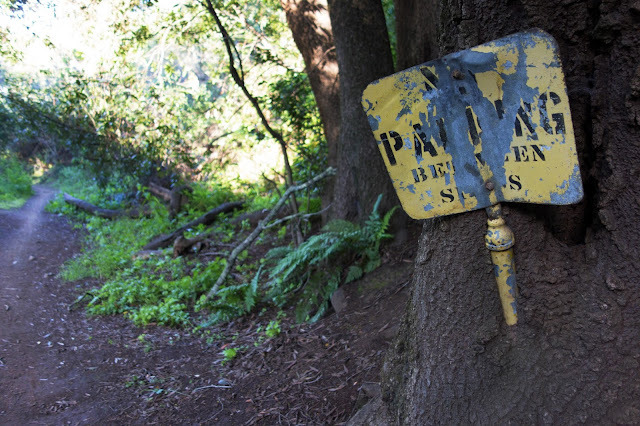 Along the singletrack, an old road sign is slowly being swallowed by a tree. We darted around hairpin turns, skirted steep side slopes, and hopscotched ruts, roots and rock gardens. Jan pointed out several spots where he had crashed his bike into juicy patches of poison oak. I felt a little relieved that Jan never talked me into riding Water Dog. On Saturday morning we embarked on a 22-mile run with our friend Chris, whose family is visiting from Switzerland. 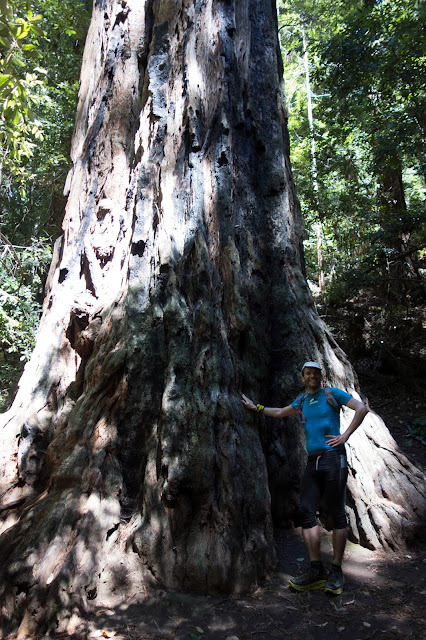 The destination was a visit to the elder statesman of the Santa Cruz Mountains and Beat's "friend," a 1,200-year-old, 300-foot-tall coast redwood named "Old Tree." 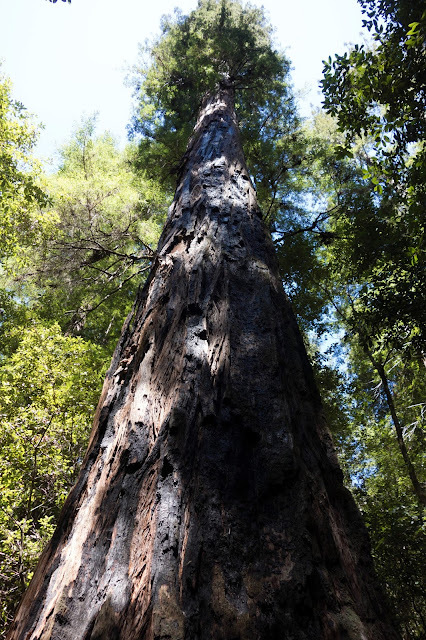 Although Old Tree lives within a half mile of the Portola Redwoods State Park parking lot, we like to give this ancient being the respect it deserves with a properly lengthy approach. Slate Creek Trail never disappoints. 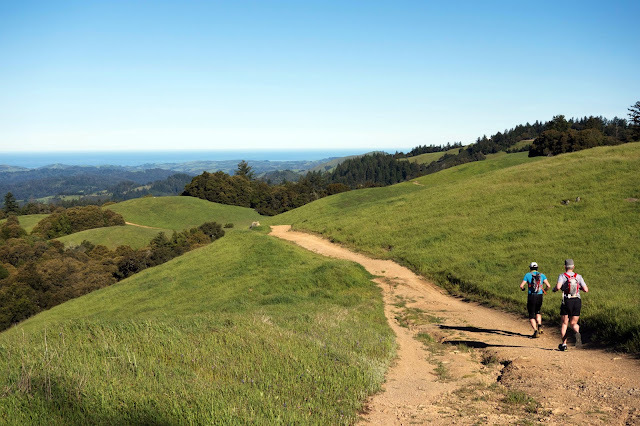 Beat mapped out an extra loop through the somewhat neglected but astonishingly empty trails of Pescadero Creek park. 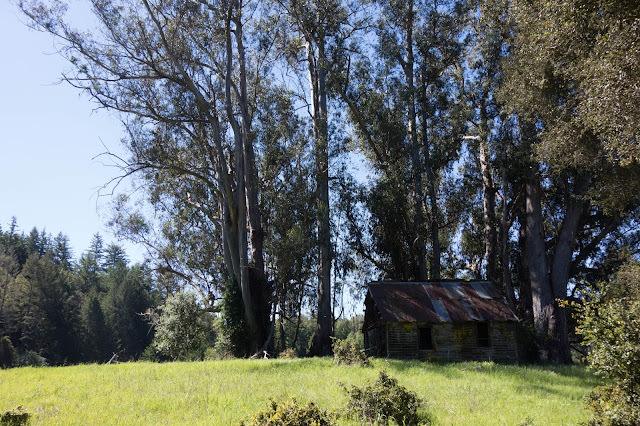 We climbed up a ridge with beautiful views, descended into grassy meadows, explored an abandoned cabin, and frolicked through redwood groves without seeing a single other person. People who know me and my small-town sensibilities have asked how I managed to cope in an overcrowded and sprawling metropolitan area with more than 7 million people. In two sentences: I didn't need to commute and thus only rarely had to deal with traffic. And one doesn't need to venture all that far into the outdoors here to really feel "out there." 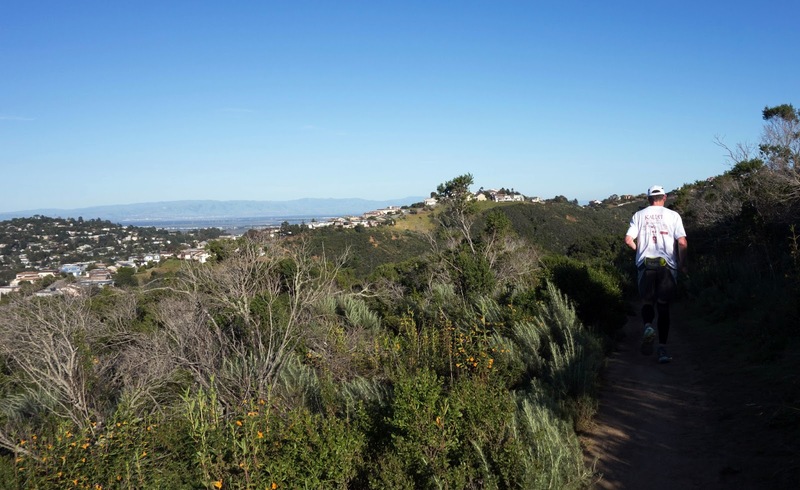 In the Bay Area, open space reaches through the sprawl like arteries, flowing with life. Beat with Old Tree. I can be sentimental about strange things, but touching the trunk of this giant always gives me a warm, hopeful feeling. If a living being can survive everything that Old Tree has survived and continues to endure ... perhaps there's always hope. I had a small scare during the flattest, easiest section of the return climb, when I managed to trip and fall directly onto my bad hand. A rigid wrist brace prevented the typical hand-extension, and all of the impact seemed to hit a small spot on my lower palm, which sent a powerful electric-shock pain into my fingers and up my arm. For the next several hours the tingling in my fingers intensified — to the point that I kept looking at my hand to make sure there weren't spiders crawling all over it, because that's exactly what it felt like. I was upset because I thought this was going to be a big setback to already slow healing, but the tingling subsided and the hand doesn't seem worse right now. It's been steadily improving — I have far more dexterity and strength, and less pain than four weeks ago. But it still hurts to grip anything, so cycling remains unappealing. Today my hip was bruised but my hand was much better, so I renewed my request to Beat to make one last trip up Montebello Road ... on foot. Beat was understandably reluctant, because temperatures were close to 90 in the afternoon, he's still easing back into training after the Iditarod, and because Montebello is a boring paved road. But I insisted this goodbye visit was important. In five years of living in Los Altos, I've climbed and descended Montebello well over 200 times. Strava records alone confirmed 185 trips, and before 2013 I frequently worked out without ever telling Strava about it, so I would guess there are at least 50 more. 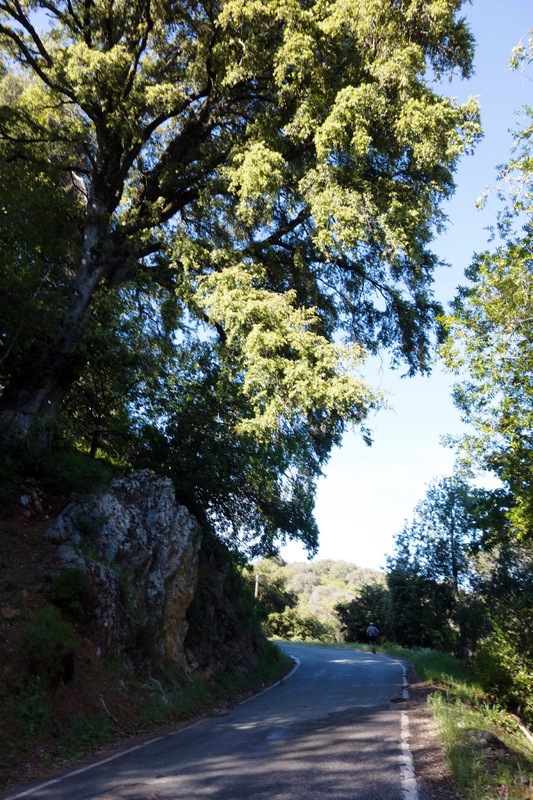 It's been my go-to road climb; my memory reels contain hundreds of intricate details along the way. Occasionally I ride Montebello in my dreams. But I've never run here because ... well ... why would you? Beat relented to the goodbye run, but he kept veering off the road and looking over the embankments, no doubt searching for an escape route. 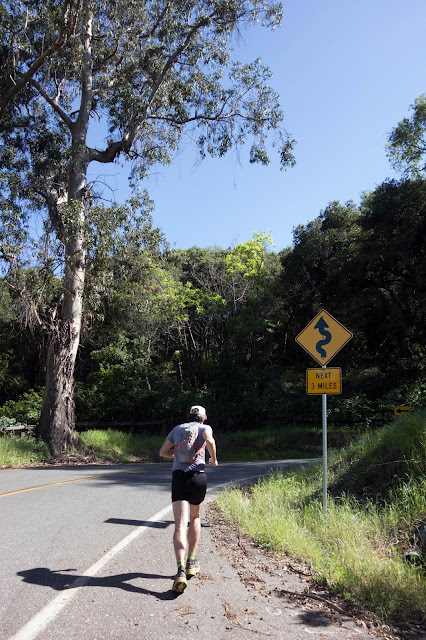 Montebello, which gains 2,000 feet in five miles, actually is a nice grade for running. 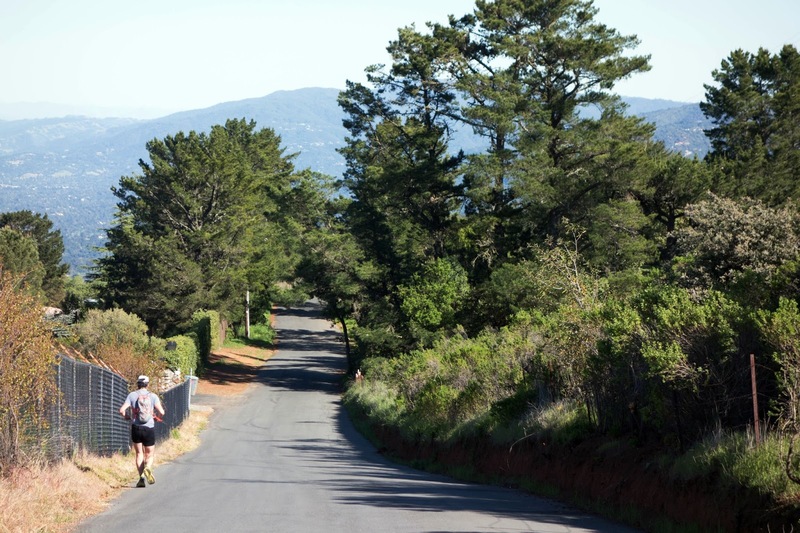 Runners call this "douche grade" — or more nicely, goldilocks grade — because it's not too steep and not too flat, it's just right. Beat was charging up the road but I was having a tougher time of it, with the heat bearing down and an upset stomach. Still, toward the top we actually passed a cyclist and nearly caught two others who passed us much earlier. I was surprised to look at my watch and realize it took just over an hour to make the climb — which is about the same amount of time it often takes me to ride the ascent on Snoots the fat bike. Of course, we then had to descend the pavement on foot which was just ... ugh. Beat must have been enjoying himself at least a little, because he started talking about "50 miles of Montebello" as a running challenge. "We could probably break ten hours!" he exclaimed. The spark for this conversation was our friend Liehann, who as part of his training plan was attempting a deca-Montebello. I rode the ten-times-climb last November as part of Fat Cyclist's 100 Miles of Nowhere event, and I still talk about it because it was a fantastic and brutal challenge. I even had pipe-dream designs on "Everesting" Montebello, which life and the move to Colorado ultimately thwarted. (Everesting is what cyclists call 29,000 feet of climbing in a single day-ride. The 100 Miles of Montebello already has 20,000 feet of climbing, but five more laps is extremely daunting.) There will be plenty of opportunities for Everesting in Colorado, I know. But I would do it tomorrow if a magic genie granted total healing of my hand in return. Liehann decided to call it a day after his eighth lap. I don't really blame him. It was hot and he'd completed a long ride on Saturday, and well, eight Montebellos are pretty brutal. But I certainly enjoyed my goodbye run, stealing long gazes out across the valley, and noticing many intricate details that I never caught in 200+ spins on a bike. Thank you, Montebello, for all the rides. Still hard to believe you are leaving the area...I always thought I had all the time in the world to FINALLY meet you and Beat...(I only get up to the Sunnyvale area every now and then for work...been a long dry spell now...almost a year since my last trip up). It is amazing how MUCH fantastic public land is up there in the middle of all those people! I'm always flabbergasted riding any of the roads/trails up off of Skyline how FEW people are out, especially on weekdays. Well...enjoy your last week in the redwoods, and I'm sure that Colorado will be FANTASTIC! (I'm quite jealous actually...I also have work in Colo Springs every now and then and I just LOVE it up there, but my wife has ZERO interest because they have 'winter'). Heal fast as I'm quite anxious for your Colorado mtb pictures and stories! I must admit I have a much better opinion of the Bay Area from your blog entries, Jill. I've always wanted to visit, but I figured it would be all pavement and hills. Now I know it's also got dirt trails and hills! Far from it. There are an insane number of state and local parks due to the foresight of some organizations, many of them less crowded than the whites!!! While some of them are a bit restrictive you'll have a hard time arguing there would be a lack of natural beauty here. 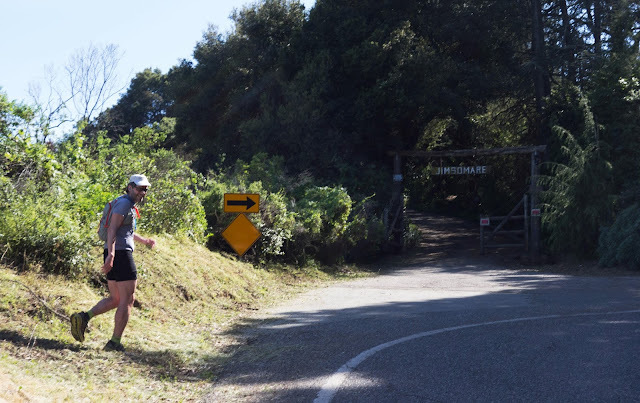 There is definitely going to be much to miss - particularly considering places like Big Sur are - were - not much farther away than the whites for us! I certainly plan to come back to my favorite places here occasionally ... it's worth the trip. Geez, after reading replies from Beat and Matt I'm almost ready to chuck Alaska for the Bay area! But...I'd miss the winters. I'm still a snow lover. Still, I'm much more interested in the Bay area now. 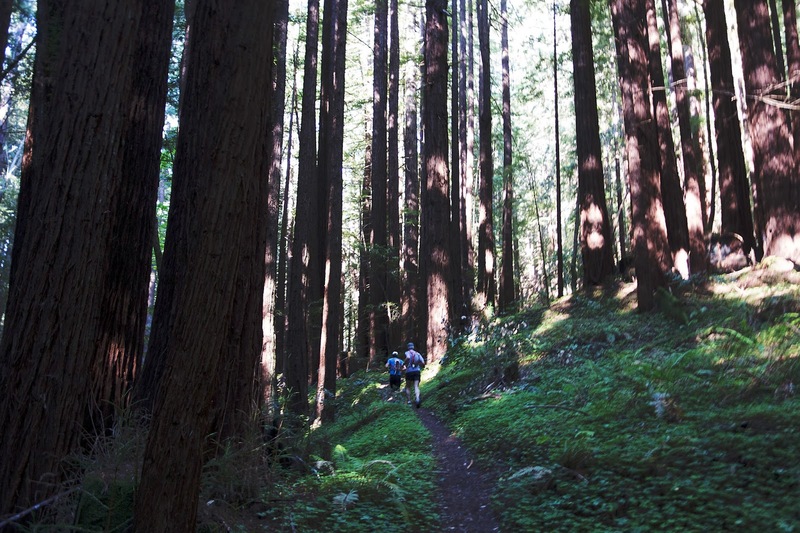 Lots of trails and REDWOODS! Traffic. Ugh! Forgot about that. Eric...it's got REDWOODS! Riding your bike THRU redwoods (both mtb and road) has got to be the most awesome riding I've done! I'm always jonsing to get another work trip up to Sunnyvale, as I bring both bikes (I only live about 3 hours south, so it's a rental-car drive vice flying...so I can come HEAVY with gear). Seriously...just fantastic biking! It's depressing to ride back at home after a month up there (I live in the Central Coast). I love that you ran Montebello. And it doesn't surprise me that you ran it that fast - I found last summer that on trails going uphill more than 10%, I was often as fast running as biking. I rode Montebello last week for the first time since my 50 Miles of Montebello,Andi have to admit it was pretty gratifying to only have to do it once this time :) Enjoy your last week here and have a great time in Colorado. Looks like you guys nearly missed Marketa who ran laps between Steven's Creek and Redwood Gulch in the shade of redwoods, thinking Montebello would be too sunny and hot on Sunday afternoon. Amazing how many parks and trails we have just in this one small area. What a magnificent tree is Old Tree! Thank you for sharing him with us. I too have seen San Fran in a different and most enjoyable light. Colorado here you come.